Chronic disorders of consciousness (DOC) are severe neurological disorders due to lesions massively affecting the brain. The treatment and prognosis in the case of DOC is an actual problem demanding novel imaging approaches, in particular, allowing one to determine the extend of brain structural changes. Diffusion-weighted MRI is a powerful candidate for in vivo probing and visualization of brain damage severity in DOC patients. In order to investigate white matter microstructural changes associated with the chronic DOC we performed tract-based spatial statistics analysis and complementary brainstem diffusion metric comparisons between patients and healthy control groups. Our findings revealed large white matter changes in the DOC patients, in particular, using novel and sensitive biomarkers based on the kurtosis scalar metrics. We hope that our discoveries help us to improve a forthcoming treatment of DOC patients. Chronic disorders of consciousness (DOC) are severe neurological disorders due to massive lesions affecting the whole brain. Chronic DOC include a broad spectrum of different consciousness states, that are difficult to unambiguously differentiate in some cases. The clinical evaluation is often subjective and based on clinical behavioral scales, that can be influenced by sensorimotor impairment, unnoticeable motor activity, pain, apraxia, aphasia, deafness etc1 . Since the correct diagnosis in chronic DOC is very important for rehabilitation strategy, recovery prognosis and patient family moral condition, clinical researchers try to find reliable objective biomarkers that could help in correct diagnostics. 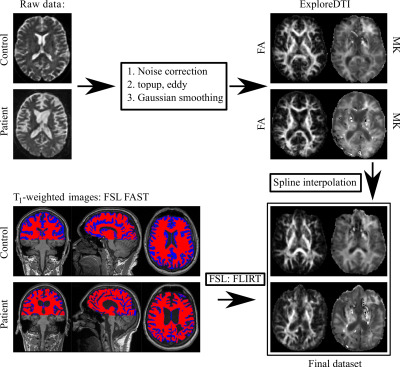 Diffusion-weighted MRI (dMRI) seems to be a powerful approach for in vivo estimation of brain damage severity in DOC patients2 and their following prognosis output. In order to investigate a diffusion kurtosis role in assessment of the white matter microstructural changes associated with the different chronic DOC states we performed tract-based spatial statistics (TBSS) analysis and complementary the brainstem diffusion metric comparison between patient and healthy control groups. 12 patients which fulfilled to the criteria of permanent DOC with traumatic or anoxic origins were studied using a Siemens 3T Verio scanner with a 32 channel head coil. The group of healthy controls consisting of 9 volunteers underwent the same MRI measurements. 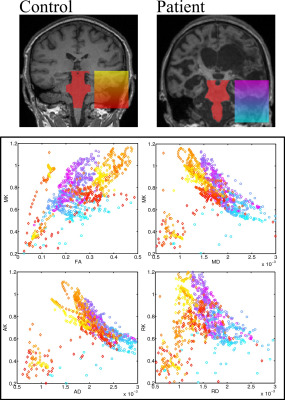 dMRI measurements were performed using a productive spin-echo echo-planar imaging sequence : 3 b-values (0, 1000, 2500 s/mm2) were chosen, diffusion-weighting images were acquired along 64 non-coplanar directions, isotropic spatial resolution was 2 mm3 . Additionally, structural images were acquired using conventional MPRAGE T1-weighted images with 1 mm3 isotropic resolution. The diffusion data were noise corrected using chi-squared distribution3, avoided of the susceptibility and motion artefacts with help of eddy FSL utility4. Diffusion scalar metrics were computed by ExploreDTI software5. Statistical tests were performed by using TBSS with a standard guidance bysearching of the most representative subject6. ROI analysis over the brainstem was performed with the interpolated and realigned data to the original T1-weighted images with a help of the affine transformation and applied cubic spline interpolation7. The post-processing workflow is presented in Fig. 1. The study was approved by the local ethical committee. Informed consent was obtained from the legal representatives of patients and from healthy volunteers before any study-related procedures. The results of TBSS analysis are presented in Fig. 2. Ought to remarkable brain WM damage, FA as well as MK, RK in patients was significantly lower in almost all WM tracts, with higher MD, and RD comparing to healthy volunteers. The less prominent difference was for axial metrics – AD and AK. The ROI analysis based on the brainstem region manually localized by the trained neuroradiologist for all subjects is presented in Fig. 3. The brainstem analysis also revealed significant difference in all metrics, with the FA, MK and AK showing the highest values in control group comparing to patients (p<10-19 (Cohen's d 0,61), p<10-12 (Cohen's d 0,37), p<10-10 (Cohen's d 0,34)), respectively. TBSS analysis proved severe white matter lesions in chronic DOC, affecting intra- and inter (corpus callosum) hemispheric tracts. Interestingly, our result suggest more radial metrics (RD, RK) changes influencing on overall diffusivity (MD, MK) than axial metrics (AD, AK), proving secondary demyelination to dominate on axial damage in these patients. As for the brainstem, the kurtosis metrics proved to be more sensitive to WM integrity disruption assessments than the conventional Gaussian diffusion values. In this study we demonstrated that the microstructural brain changes in chronic DOC patients can be quantitatively estimated by the DKI scalar metrics with higher sensitivity comparing to the conventional DTI ones. We proved that the non-Gaussian diffusion metrics are feasible criteria for further in vivo diagnostics and treatment of DOC. The study was supported by the Russian Science Foundation under grant 16-15-00274. Fernandez-Espejo D, Bekinschtein T, Monti MM, Pickard JD, Junque C, Coleman MR, Owen AM Diffusion weighted imaging distinguishes the vegetative state from the minimally conscious state. 2011 NeuroImage 54:103–112. Andersson and Sotiropoulos, Neuroimage 125 (2016) 1063. Leemans et al., Proc. ISMRM 17 (2009) 3537. Smith et al., Neuroimage 31 (2006) 1487. Fig. 1 The post-processing workflow. Fig. 2 Results of TBSS analysis based on DTI and DKI metrics. The significant differences are marked by thick markers and emphasized for controls (C) and patients (P). Fig 3. Results of statistical analysis between controls and patients group in the brainstem region. The spatial localisation of the diffusion metrics is encoded by colour.